I got to meet Lisa Vanness at the Seattle-ish Pen Posse this month, and she brought a few inks for everyone to try. One of the inks was L'Artisan Pastellier Turquoise, so I snagged a sample for review. You can find the ink at Vanness Pens. Turquoise is just that-a bright turquoise. Seasonally I would use this ink in the spring or summer. In large swabs and drops, you can see the ink's pink sheen. On 32 pound copy paper, there was just a tiny bit of show through, but no bleeding or feathering. Ink swabs for comparison, left to right (top to bottom for RSS): Kobe #48 Water Source Marche, L'Artisan Pastellier Turquoise, and Robert Oster Aqua. 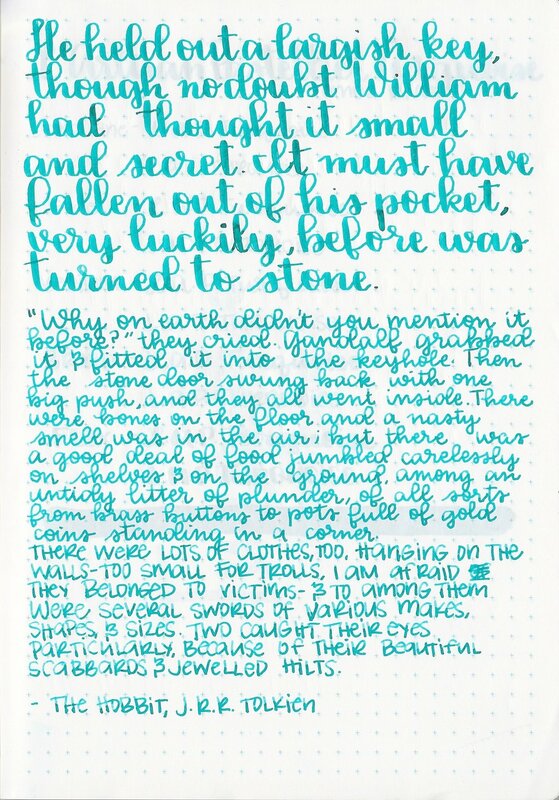 Diamine Aqua Lagoon, Diamine Marine, and Kaweco Paradise Blue. Click here to see the blue inks together. Diamine Marine looks the closest from the swabs. I used a Pilot 912 FA for the top paragraph, then I switched to a medium Lamy Al-Star. I used Tomoe River paper. I didn't have any flow issues with the ink. Overall, this ink reminds me of Kobe #48 Water Source Marche and Diamine Marine, so there are some other inks out there that have a similar color. The ink is well behaved, but is too similar to other inks I already have, so I don't need a full bottle of this one. Disclaimer: I received this sample free of charge, but all photos and opinions are my own. There are no affiliate links on this page.